What wine would you pair with Bach’s cello suites on a warm night in June? A Saxon Reisling? An Alsatian Pinot gris? Cellist and composer Ian Maksin returns to City Winery in Chicago on June 2, 2015 for a concert of Bach, Vivaldi, and Piazzola paired with pop, jazz, and of course – wine. Maksin, who has worked with a range of artists from conductor Michael Tilson Thomas to rapper Snoop Dogg, mixes music from many genres to bring repertoire new audiences. “Only a small percentage who attend consider themselves regular classic music goers, and quite a few people who came to my concerts have heard the cello live for the first time,” Maksin said in a phone interview. For his upcoming performance, Maksin is joined by the Goran Ivanovic Trio, a jazz combo that incorporates traditional Balkan music and Latin and flamenco guitar into their sound. Ivanovic plays guitar and is joined by Matt Ulery on bass and Pete Tashjian on drums. The program will include familiar and not so familiar classical works, including Bach’s beloved Suite No. 1 in G Major for cello and Verano Porteño from Cuatro Estaciones Porteñas, Pizzolla’s tango inspired take on Vivaldi’s Four Seasons. Maksin has also arranged “Vedrò con mio diletto” from Giustino, an aria he fell in love with after hearing a recording of it featuring countertenor Philippe Jarrousky. But, how does the ensemble play a piece originally composed for a singer and orchestra? City Winery, which has a fully functioning winery onsite, will be making a special vintage wine exclusively for the concert and available to drink on site that will feature a picture of Maksin and Goran on the label. 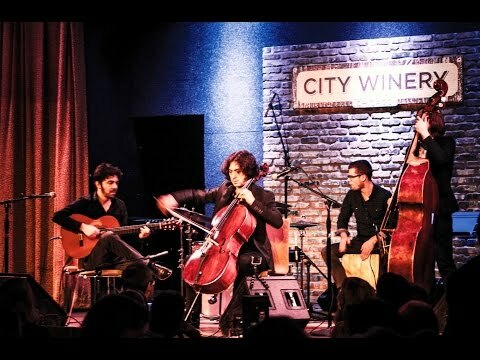 Despite the laid back environment of the venue, which has a full bar, restaurant, and table service available so that audiences can drink and dine while the enjoy live music, the focus is on the performances at City Winery. This is excellent news indeed for those who like an alternative to the traditional “sit in silence or be shushed” concert experience, but who also don’t want to compromise their ability to fully take in all the sounds of the music.